Magpies do learn much of their cognitive skill by the level of intake of energy. Reproductive capacity also improves skills. 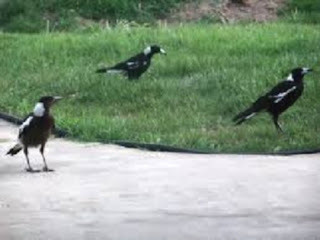 Australian magpies are very intelligent. Found all over the country, they love urban areas. They soon latch on to your pet's food bowl and accept any scraps you throw out. Gymnorhin tibcen dorsalis live in groups of three or more. A study was done to find out more about them. Findings were based on detor-reaching, where food was hidden in transparent containers. Food was also put in the same place and birds were observed. Unfortunately, little detail of how this proved the connection with non-social group performance. The social milieu hypothesis is still the primary causative factor. Just how this and individual discerning cognition advancement can be separated for research is problematic. They are complex creatures. Bold claims by this study are yet to be justified. Just seeing magpies behave in our gardens shows they know what they are doing. Scientists are not the only ones observing the maggies. People cannot but admire our smart feathery friends. More work is needed to identify what is really going on. Cracticus are doing very well living alongside humans, even breeding in cities and vigorously defending their nests. Avians must do what comes naturally. They are clever: we all know that.